When you create a histogram with statistical software, the software uses the data (including the sample size) to automatically choose the width and location of the histogram bins. The resulting histogram is an attempt to balance statistical considerations, such as estimating the underlying density, and "human considerations," such as choosing "round numbers" for the location and width of bins for histograms. Common "round" bin widths include 1, 2, 2.5, and 5, as well as these numbers multiplied by a power of 10. The default bin width and locations tend to work well for 95% of the data that I plot, but sometimes I decide to override the default choices. 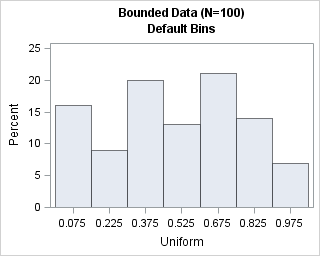 This article describes how to set the width and location of bins in histograms that are created by the UNIVARIATE and SGPLOT procedures in SAS. Why override the default bin locations? 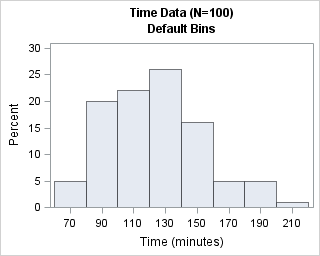 For a histogram of time measured in minutes, a bin width of 60 is a better choice than a width of 50. Bin widths of 15 and 30 are also useful. For a histogram of time measured in hours, 6, 12, and 24 are good bin widths. For days, a bin width of 7 is a good choice. For a histogram of age (or other values that are rounded to integers), the bins should align with integers. You might also want to override the default bin locations when you know that the data come from a bounded distribution. If you are plotting a positive quantity, you might want to force the histogram to use 0 as the leftmost endpoint. If you are plotting percentages, you might want to force the histogram to choose 100 as the rightmost endpoint. To illustrate these situations, let's manufacture some data with special properties. The following DATA step creates two variables. The T variable represents time measured in minutes. The program generates times that are normally distributed with a mean of 120 minutes, then rounds these times to the nearest five-minute mark. The U variable represents a proportion between 0 and 1; it is uniformly distributed and rounded to two decimal places. How do we control the location of histogram bins in SAS? Read on! The default bin width is 20 minutes, which is not horrible, but not as convenient as 15 or 30 minutes. The first bin is centered at 70 minutes; a better choice would be 60 minutes. The histogram on the left has bins that are centered at 30-minute intervals. This histogram makes it easy to estimate that about 40 observations are approximately 120 minutes. The counts for other half-hour increments are similarly easy to estimate. In contrast, the histogram on the right has bins whose endpoints are 60, 90, 120,... minutes. With this histogram, it easy to see that about 35 observations have times that are between 90 and 120 minutes. Similarly, you can estimate the number of observations that are greater than three hours or less than 90 minutes. Both histograms are equally correct. The one you choose should depend on the questions that you want to ask about the data. Use midpoints if you want to know how many observations have a value; use endpoints if you want to know how many observations are between two values. WARNING: The ENDPOINTS= list was extended to accommodate the data. This message informs you that you specified the last endpoint as 210, but that additional bins were created to display all of the data. The histogram on the left is not optimal for these data. Because we created uniformly distributed data in [0,1], we know that the expected count in the leftmost bin (which is centered at 0) is half the expected count of an inner bin. Similarly, the expected count in the rightmost bin (which is centered at 1) is half the count of an inner bins because no value can exceed 1. Consequently, this choice of midpoints is not very good. For these data, the histogram on the right is better at revealing that the data are uniformly distributed and are within the interval [0,1). If you do not need the statistical power of the UNIVARIATE procedure, you might choose to create histograms with PROC SGPLOT. The SGPLOT procedure supports the BINWIDTH= and BINSTART= options on the HISTOGRAM statement. The BINWIDTH= option specifies the width for the bins. The BINSTART= option specifies the center of the first bin. WARNING: The specified BINWIDTH= value will be ignored in order to accommodate the data. That message usually means that the minimum value of the data was not contained in a bin. For a bin width of h, the BINSTART= value must be less than xmin + h/2, where xmin is the minimum value of the data. In summary, for most data the default bin width and location result in a histogram that is both statistically useful and easy to read. However, the default choices can lead to a less-than-optimal visualization if the data have special properties, such as being time intervals or being bounded. In those cases, it makes sense to choose a bin width and a location of the first bin such that reveals your data's special properties. For the UNIVARIATE procedure, use the MIDPOINTS= or ENDPOINTS= options on the HISTOGRAM statement. For the SGPLOT procedure, use the BINWIDTH= and BINSTART= options to create a histogram with custom bins. Thanks for this. I was trying to use SGPLOT histogram with BINSTART for the first time. Until reading this post, I didn't realize that you need to specify the *center* for first bin rather than the *start* of the first bin.